Puffed Wheat Parfait for National Peanut Butter Day! The first week of the New Year has opened with triumphant bang- I have high hopes for the upcoming days that will mesh together to mold 2015. Strange, typing that phrase on this document. 2015. It feels like a wind has settled right beneath my fingertips, a final goodbye to 2014. This week was also a celebratory one for my taste buds. 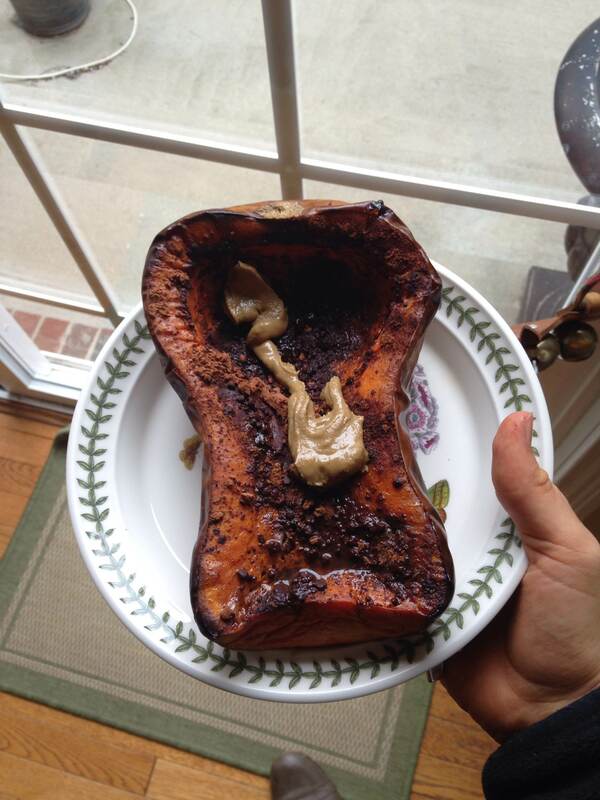 I whipped a butternut squash from my closet and performed some magic, and am pleased to share the final result! Look at this beauty. Oh, it was gone so fast. I couldn’t get enough of the rich taste! It was so easy too. First, I cut the stem from the squash, cut it in half, and seeded it. Then, I heat the oven to “convection bake, 425F” and placed the halves in on a baking tin, face up, and let it bake for around 45 minutes. Before I put the halves in, I topped them with some cocoa powder, cinnamon, and stevia. Then, after I let it cool, I added peanut butter and coconut oil, and devoured it! Some melted dark chocolate on this would have been perfecttttt. I need to buy more squash ASAP, I am down to the bare bones in my pantry…. 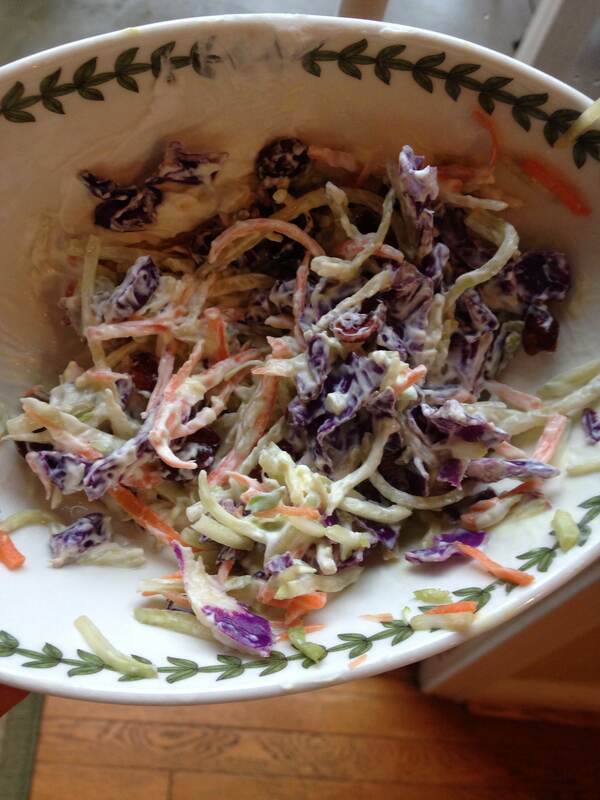 I also created some quick and easy broccoli slaw. At Meijer this week, all of the broccoli slaw went on “managers special”, and was about $1 for a huge bag of the stuff. So, naturally, I bought four big bags. I made broccoli pasta with most of it (just broccoli slaw sautéed with garlic and spaghetti sauce- SO EASY AND YUMMY), but I had an idea to make some coleslaw after I saw something similar on pintrest. This was easy as well (I love easy!). All I needed was 1.5 cups raw broccoli slaw, 1/4 cup plain greek yogurt, 1 teaspoon apple cider vinegar, 2 teaspoons Dijon Mustard, some spices (I threw in onion powder, paprika, and some pepper), as well a tablespoon of craisons (or raisons), and a tablespoon of sunflower seeds. So so so easy, and so delicious! Just mix and serve! 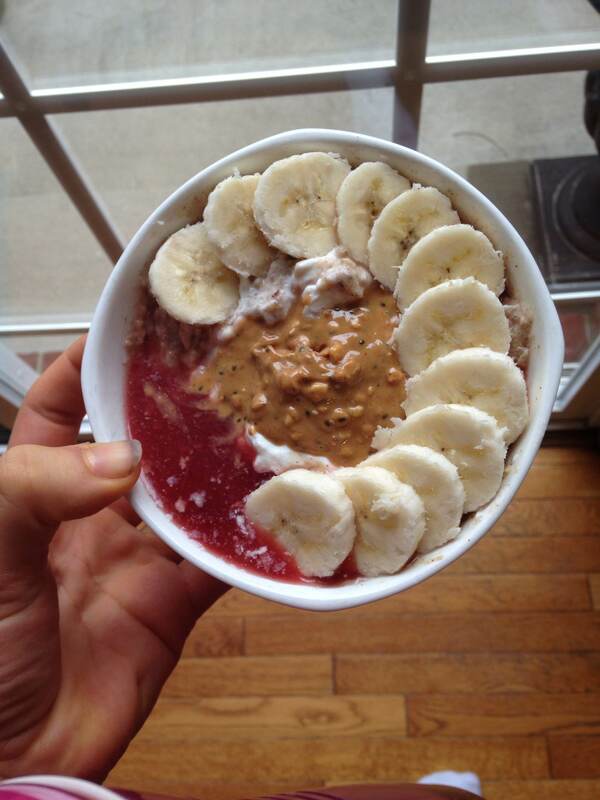 Sweet potato pomegranate oats, topped with a banana, peanut butter, and a splash of pomegranate juice. So wonderful, and so full of carbilicioius energy!